With the recent launch of iOS 11.3 comes a pool of improvement and exciting features and functionalities. Hence it becomes vital to familiarize with the top iOS application development trends. One should always keep in mind that Apple is very particular about their app updates and if one fails to follow correctly, you might have to face a lot of problems for releasing the application on the Apple App Store. According to a statistics it is said that there are over 2.2 million applications in the Apple App Store by the end of 2017. The constant change in the trend causes a significant impact on many businesses. Android leads in regarding trust factor and generating more revenue, however, iOS apps excel in technology and the security compared to Android. As most of the iOS developers will be aware of Swift 4, that it is a programming language developed by Apple to support iOS and Linux operating system. Yes, of course, it is an advanced version of Swift 3, and it has enhanced its scalability and security aspects. Swift 4 will make app development all the more straightforward and also the consumption of the device memory will be reduced. People often use Siri as a personal assistant. It is one of the reasons why Artificial Intelligence is in the boom as it understands what people are looking for and Siri helps them with the answer in no time. In addition to this feature, Siri also offers a GPS pin through which you can easily access the Citi Mobile App which will act as a task manager. Hence Siri is and will be in the limelight until something significant comes in the market. Core Machine Learning or Core ML is a programming framework which is launched by Apple for enhancing the efficiency of features related to the Camera, Quick Type or Siri. This will prove to be useful to the iOS application development process as developers simply have to add a few codes to enhance the security of the application and improve its usability. It will also be useful for face detection, language detection and developing the AI-based games. With this feature iOS app, developers can surely come up with interactive apps. Augmented Reality has been an essential feature for the iOS app developers. However, the recently launched version unveils ARkit The sole purpose of ARKit is that it will be helpful in developing 3D and virtual reality-based iOS apps which is much in demand nowadays. ARkit is said to be getting immense support from Amazon’s Sumerian application platform. Augmented reality and Virtual reality apps seem to have a fruitful time in the coming years. Apple Pay is a digital wallet introduced by Apple through which the iOS users can make payments. It supports all the Apple devices including iPhone, iPad, Mac, apple watch and it is highly secured and iOS users can make purchases like booking flight tickets, make hotel reservations and gives the facility of sending and receiving money through messages hence making it a unique application. NativeScript and ReactNative have replaced the cross-platform app trend. This hybrid app is likely to resolve performance related issues and improve the user experience. This will be useful in developing hybrid apps which will have enhanced UX and UI and creating a hybrid app as it is time-saving. iOS 11 was introduced to meet the specific requirement of managing files. This is a cloud-based application that allows users to store valuable information in a single file and this can be accessed through any Apple device. This proves to be an essential feature for business owners. All a user needs to do is only create a single dashboard where they can store all the essential documents which may include videos and images. This reduces the time for searching the records in multiple locations. Apple HomeKit was introduced to address the need for home automation. This futuristic technology allows iOS app developers to create applications in the future that can be integrated with Apple devices using Apple HomeKit. This is a significant invention in the home automation and making smart homes and fortifies IoT networks. The introduction of Qualcomm is a significant invention with enhancement of battery life. The changes took place because of the growing demand for the tablet industry and hence new apps, and new features are expected in the coming years especially for the iPad. The App Store is the key driver behind the rush in productivity on mobile devices, but it has turned much crowded with 2 million plus apps present online and finding precise apps is getting complicated. In the coming years, we can expect more free apps especially the game-based apps. If you are in the mobile application space, it's imperative to comprehend the mixture of methods for marketing and promoting your apps. 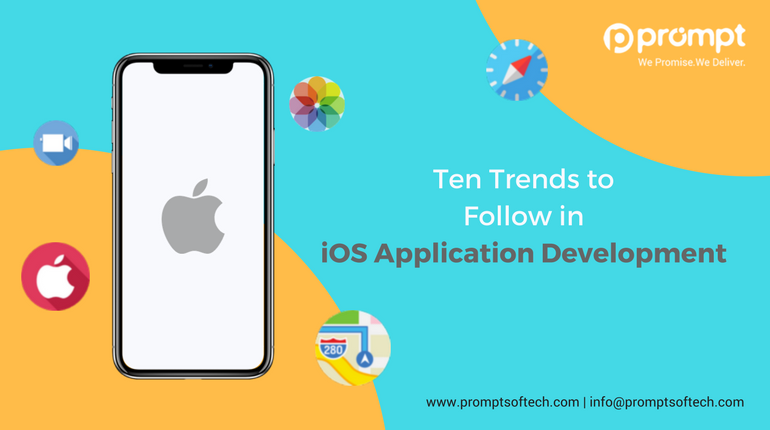 The iOS application development industry is going through a significant transition notably the launch of iOS 11 and 11.3, and after the launch of iPhone X, there has been a lot of changes hence it is vital to keep track of the latest updates. Apple has always been innovative in altering and bringing new features and providing a better experience to its end customers. It becomes essential to update your apps on a regular basis for best performance. Prompt Softech has expert programmers in both native and cross-platform mobile application development. This means that you can hire our iOS and Android experts who have specialized in building high-end mobile applications and software. We can create advanced technology solutions for all types of business and industry verticals.